Can't decide between a traditional or infrared sauna? Now you don't have to. 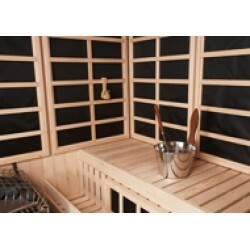 These unique combination saunas offer the best of both worlds, allowing you the opportunity to choose a traditional or infrared experience for your relaxing session. Flexibility and choice are now at your fingertips. The choices don't stop there. Our combination saunas can be either permanently installed using our custom precut kits or prefabricated for maximum portability. Helo InfraSauna, 70-100 cu.ft., 120V, 20 amp, 2.2KW, Junior 2.1KW Heater Includes SaunaLogic ..
Helo InfraSauna, 100-150 cu.ft., 240V, 2.35KW, Junior 3KW Heater Includes SaunaLogic control,..
Panel Built Prefabricated Combination Sauna and Infrared Room, 4' x 5' x 7', IS 200 System, Junio..
Panel Built Prefabricated Combination Sauna and Infrared Room, 6' x 7' x 7', IS 400 System, Viki ..
Helo Steamy 60 Manual Fill heater and generator, 6KW, 240V, PH1 (175-310 cu. ft.) Combination..
Panel Built Prefabricated Combination Sauna and Infrared Room, 4' x 6' x 7', IS 200 System, Junio..
Panel Built Prefabricated Combination Sauna and Infrared Room, 6' x 8' x 7', IS 600 System, Viki ..
Panel Built Prefabricated Combination Sauna and Infrared Room, 5' x 5' x 7', IS 300 System, Viki 4.5..
Panel Built Prefabricated Combination Sauna and Infrared Room, 6' x 9' x 7', IS 600 System, Viki ..
Panel Built Prefabricated Combination Sauna and Infrared Room, 5' x 5' x 7', 5 Sided, IS 300 Syst..
Panel Built Prefabricated Combination Sauna and Infrared Room, 6' x 10' x 7', IS 600 System, Viki..
Panel Built Prefabricated Combination Sauna and Infrared Room, 5' x 6' x 7', IS 300 System, Viki ..
Panel Built Prefabricated Combination Sauna and Infrared Room, 7' x 7' x 7', IS 600 System, Viki ..
Panel Built Prefabricated Combination Sauna and Infrared Room, 5' x 7' x 7', IS 400 System, Viki ..
Panel Built Prefabricated Combination Sauna and Infrared Room, 7' x 7' x 7', 5 Sided, IS 600 Syst..